Members of The American Legion Family - Wisconsin served breakfast to Airmen prior to their families arriving for their annual Christmas Party. 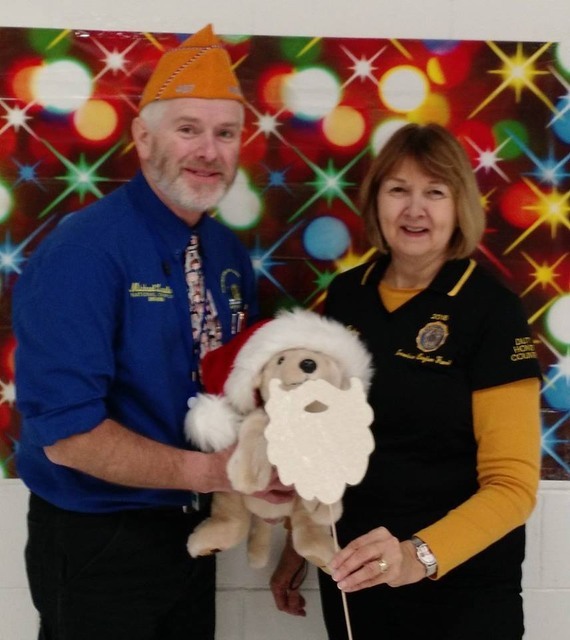 The American Legion provided/served cookies, help the children play games and assisted with photos with Santa. Date(s): 12/06/2015. Album by Mike Rohan. Photos by Mike Rohan. 1 - 21 of 38 Total. 1024 Visits. SAL Past National Commander David Faust, Janice Lawler, SAL National Chaplain Mike Lawler, Candidate Denise and Mike Rohan and Past Dept. of Wisc. Vice Commander Rich Ruland. Legion Family volunteers preparing for the party. SAL National Chaplain Mike Lawler, Janice Lawler, Santa and Air Guard Family Readiness Program Manager Tanya Genz. GI Josh preparing to take off with Santa in his Fighter Jet. Air Guard members and their families enjoying the party. Post 151 Commander Chris Ogden tried out Santa's chair while his wife Jan stand near by. Mike Rohan preparing the cookies for the party. SAL Past National Commander David Faust with Santa. Wisconsin Adjutant General BG Donald Dunbar & Candidate Denise after serving breakfast. Mike Rohan rearranging breakfast bagels. Janice Lawler serving coffee to the Airmen. SAL National Chaplain Mike Lawler, Roni Fowler, and Jan Ogden serving breakfast to the Airmen. Past Department of Wisconsin Vice Commander Rich Ruland serving breakfast.